These e-books are great overviews and introductions to the Elements 11 tools, and cover a good deal of helpful material for getting started with the products or picking up more skills and techniques if you’re already familiar. Each volume is a collection of techni­cal lessons for learning how to best use the popular programs. The downloads are 7.5 MB (PSE) and 5.5 MB (PRE) in size, in PDF format (get the free and better Adobe Reader XI, if you haven’t done so yet). All you need to do to activate the ebook downloads is sign in with your Adobe ID (which is easy to create if you haven’t already got one). If you don’t yet own Elements 11, just download the fully-working trial from Adobe to run it for free for 30 days. Some of the training in the book will be relevant for older versions of Elements as well, although if you need them we’ve also got older ebooks for Elements 9/10. See our Elements 11 Launch Review for more details on the new products and included features. If you currently have an older version of the software, check out this chart with the comparison of differences between Photoshop Elements 11 vs. 10 vs. 9 vs. 8 vs. 7. Or, if you prefer to learn by video training instead, don’t miss these three hours of free video tutorials for Photoshop Elements 11, or alternatively these free tuts for Photoshop Elements 10 & 9. There’s also two hours of free how-to videos for Premiere Elements 11. Here below are the tables of contents and the access links for the free books… enjoy! Do you have any questions about Photoshop/Premiere Elements? Just ask them below and we’ll get you answers fast! i was wondering with the adobe photoshop elements 11, would i be able to take a person in the picture and put a different background in? or add like special effects to the person, such as wings or something similar? 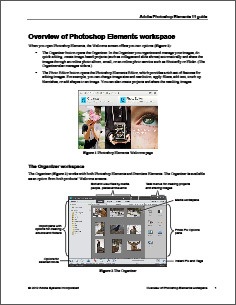 I heard about the Creative Cloud and I heard that Adobe Lightroom was included in it. Is Photoshop or Premiere Elements also contained in it? However, the full versions of both Photoshop CS6 and Premiere Pro CS6 are included in the Cloud, which are even better. Here’s a complete list of everything that’s in the Creative Cloud – and if you’d like to get started using it then you can easily sign up for a free level of membership. Hope that answers your question – if not then just post back. I am new to Premiere Elements 11 . . . made a trial video. When I try to pull my project up it states the media is offline. I am clueless as what to do. I did try to locate files (photos) and see them in my organizer. When I try to play back my project, the music is there but my images have been replaced with a red background with another language (not English) written over it. Hi Stacey, it sounds like you got into a situation where your project lost contact with its source files… But here is the solution to that. Hi, I tried to download the Elements 11 guides and it doesn’t work. It says I need to sign in with Adobe ID, but every time I click on the “Sign In” button it just comes back to the same page that requires you to sign in to get the download button/link. Yet, if I go to home adobe page I can sign in, but still the other page for Elements downloads says I need to sign in and then won’t let me sign in. ??????????????????????? Hey Bruce, sounds like something got crossed up on your web browser. Clear your browser cache and cookies, and try again… Or give it a shot using a different browser. I tried it again later and finally this time it worked ok! Great, glad to hear that Bruce and thanks for letting us know… Enjoy the free books! 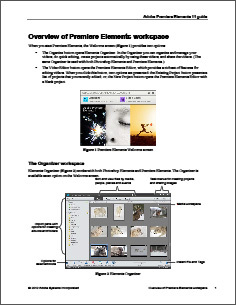 I need the instruction manual for Premiere Elements 12, so I can download it. 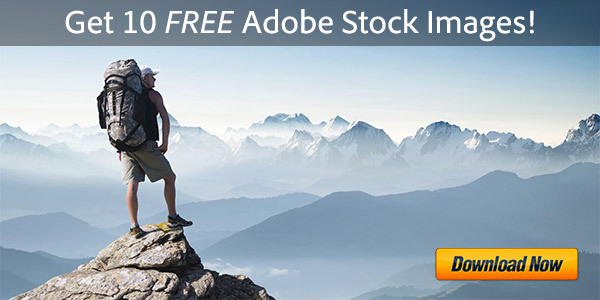 Thanks for the great resources, I love many of your free Adobe books. I am however having trouble downloading the one for Elements (A technical guide) here on this page. It doesn’t seem to want to play ball. I thought I’d already have Reader but it comes up with a big sign saying best to open this in Adobe Reader-Download now. I downloaded it, clicked the link again and I get the same page every time. Hi Garry, glad you like them! It may be trying to open the Elements books in your web browser, after downloading… But these files are PDF Portfolios which cannot be viewed in your browser – and if you try, it may direct you to the Adobe Reader download web page. In order to access these tutorials, you need to save the file to your Desktop (or somewhere else on your computer) and then open the file with Adobe Reader to view the contents. If you have already downloaded it and it is still not working then please let us know. Thanks for your question and hope you get a lot out of all the free books! I was told I would get free downloadable books after getting Photoshop and Premiere 14 but only see 11 here. Is there a newer version of these books? What Are the Differences Between Adobe PSE 14 vs. 13, 12, 11? But per your comment, what exactly were you told about free downloadable books for Photoshop & Premiere Elements 14, and by whom? I guess “told” was the wrong word to use. I read it while looking through the web info given me after buying those 2 products and made the assumption that they would be for the versions I had. Thanks for your answer, I will get the books you say are still good for my version. Sure Bob, glad to help! 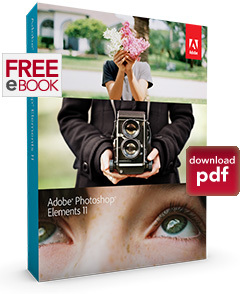 We aren’t aware of any other free books for Adobe Elements, so these are probably what you read about. Hope you enjoy and get a lot out of them!